Lighting up the woods for some horror. 4K HMI into an ultra bounce. basic disro and some dimmers. re wiring a 12v transformer for in set LED’s. Gaffer Casey Schmidt attempting to make paper shims for a make sift connection on some “Indi-Systems” dolly track. Working with Hand Crank Films on top of the Bellingham Herald Building in downtown Bellingham, Wa. On set of the Music Video “Do You Remember” for Seattle band Cumulus. 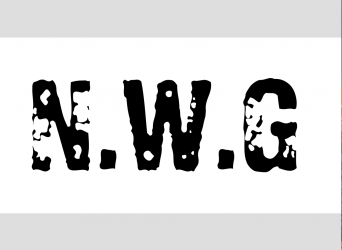 Filmed in Northwest Grip’s home town of Bellingham, WA. Gaffer Casey Schmidt operates the door way dolly on tracking shot for an Industrial Credit Union commercial filmed in Bellingham, Wa. 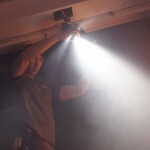 Casey using his magical gaffer powers to illuminate a practical bulb using only his mind! Portland based jib operator with his 30′ crane. Artificial snow day with the dolly. dialing in the exposure using only natural light. Gaffer Casey Schmidt crafted a make shift Duve box for a day to night shot on the film “The Arborlight”. An interior shot of a sic-fi scene for the seattle 48 hour film fest with Seattle based actress Angela DiMarco. DP Domenic Barbero and Gaffer Casey Schmidt await a time lapse overlooking a sunset mountain view. Gaffer Casey Schmidt and a PA fly a 12x silk to tackle a sunbeam obstructing the talent. 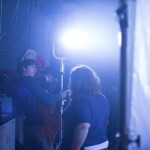 Creating some light shafts for a dramatic scene on the set of “Frink” filmed in Rosyln, WA with DP Domenic Barbero. make shift tungsten array with 4K HMI PAR crane mounted. Casey Schmidt on set of a music vid directed by Jordan Alberstein withBellingham based production company Hand Crank Films. analyzing haze to light ratio with a practical lighting set up with DMX on set of the “Do You Remember” music vid for Cumulus. a 12X silk provides a soft landing for talent as the exit their vehicle for a character reveal. 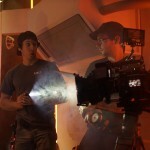 Casey Schmidt, gaffer on set of “Miles” prepping a set of 12 volt Kino Flo’s for a driving shot. 1st AC Stephanie assist’s with a small LED. 1st AC Cameron Currier from Hand Crank Films stands under a quick 2×3 solid for rain protection on a wet day in Wa film making. Crowd Shot for a music vid in Bellingham. Goal post lighting a control booth. Casey Schmidt diffusing a small practical lamp with 250. Utilizing a shower backsplash for a bounce source with Redhead fixture. Redirecting a bounce board for a Chevrolet commercial in Bellingham, WA. Gaffer Casey Schmidt assembles some quick rain hats for a day light fill shot on the set of ” The Arborlight” directed by Kevin and Phillip Harvey based out of Seattle, WA. 1st AC Coburn Erske and Director Editor Gabe Conroy analyze a scene for a Seattle music video. 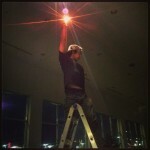 Gaffer Casey Schmidt eying a fresnel freshly gelled with full CTS. Christian Saxton 1st AC operating the MOVI on set of “The Arborlight” in Kitsap County, WA. Crew on set of “Frink” high in the mountains outside of Roslyn, WA. 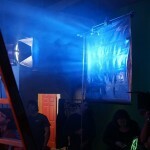 On set of the music video “Do You Remember” for Seattle based Indi band “Cumulus”. Circle track shot for commercial weapon optics company. mirror board through a cookie to achieve a lighting effect on a bare restaurant wall. Casey Schmidt pondering a new lighting set up on the set of Dark Darkness with Hand Crank Films. Casey rocking the ceiling clamps. DP Domenic Barbero with 1st AC Coburn discuss a shot on a much video in Seattle, WA. Quick screen capture from our Epic cam on “We’re Being Spy’s Right Now” filmed outside of Tri-Cities, WA. Gaffer Casey Schmidt awaits talent with a silver bounce. PA Garret Myrick enjoys the mountain view as DP Domenic Barbero and 1st AD Sean Patrick Burke entertain each other. 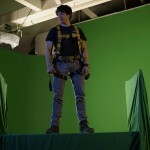 Gaffer Casey Schmidt working swing as jib op on a commercial shoot for Mackie Speakers in Bellingham, WA. Working with Hand Crank Films. maximizing a 1200 HMI PAR with no lens for a pool of backlight on a night exterior scene. DP Domenic Barbero getting the Royal treatment as grips Nick and Tyler provide rain cover for the Epic. DP Chris Kozer from Hand Crank Films ready’s a shot for a Helman’s Mayo Commercial shot at Pike Place Market in Seattle, WA. DP Chris Kozer, 1st AC Cameron Currier and Gaffer Casey Schmidt review a dolly/jib move on the JL Fisher 11 Dolly. 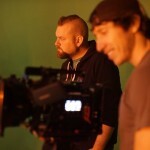 Dolly grip Justin re setting DP Domenic Barbero on a commercial for Mackie Speakers, filmed in Seattle, WA. DP Chris Kozer along side Assistant producer Alex Stowe framing a shot for Caleb Young’s film “The Ghost Woods.” Filmed around Whatcom County in Wa. 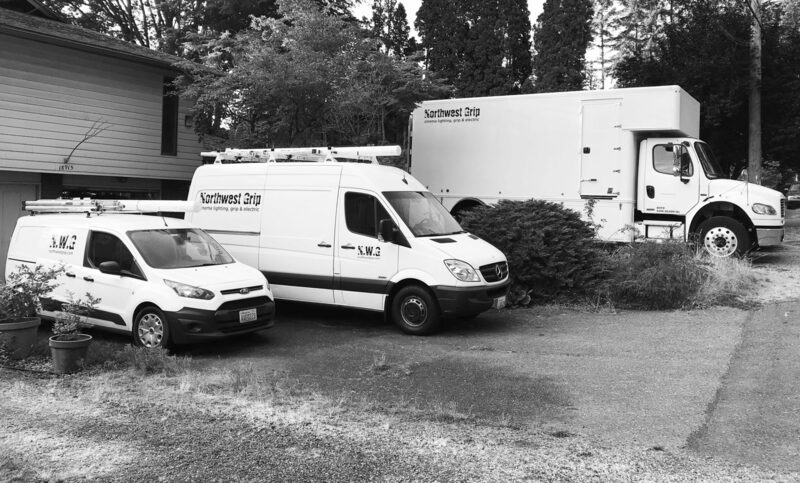 Panoramic iphone pic of our 70′ Dolly track shot in the deep woods in Whatcom County, WA. Key Grip Nathan Hellinsgo produced a wooden frame rain cover for a moving shot with an HMI keying the inside of a moving city bus. 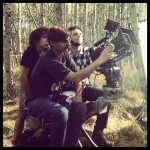 Gaffer Casey Schmidt re focuses a pair of studio 2k’s for some fill on a music video. Door way Dolly doubling as a head cart for a fundraising video at Bellingham International airport. soft window day light boosting. Gaffer Casey Schmidt along side art director Avielle Heath from Hand Crank Films on the set of “Mackie Zombies” in a closed Mount Vernon street corner. Hiding a series of Kino Flo Diva lights for a Safeway commercial at Swedish Hospital in Seattle, WA. A silly parody music video filmed in Gig Harbor, WA. Utilizing lots of soft light on the set of “We’re being Spy’s Right Now.” Overhead rigged by Key Grip Hefe Sebachand lit by Gaffer Casey Schmidt. Gaffer Casey Schmidt applies some CTS to a side arm to warm up an HMI kicking in an exterior window. Michael Klevin sneaked a great shot of gaffer Casey Schmidt striking a small ARRI 650 on the set of “Miles” in Seattle, WA. a pair of 1.2 HMI’s provide an ambient top light for a food commercial scene below.